Starting this fall, Sound Football Club will partner with TOCA Football at its new Lynnwood facility to provide the revolutionary TOCA Training method to Sound’s premier soccer members. The TOCA Training method employs its small-ball philosophy and TOCA Touch Trainer, a ball delivery machine, to dramatically improve precision, elevate playing skills and build confidence to perform at the highest level. The new facility in Lynnwood is an expansion from TOCA Redmond location, also operated by the Schmetzer family with a 40-year history of developing college and professional soccer players. 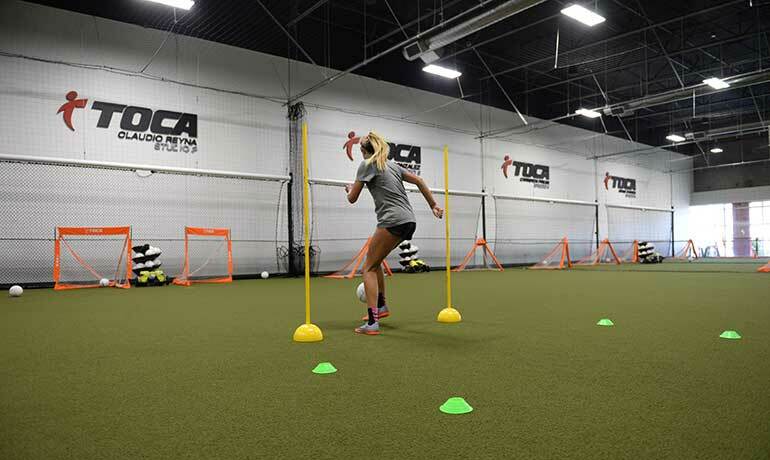 TOCA Lynnwood location boasts four training Studios, primarily used for individual and pairs private sessions, providing quality repetition (approximately 200-300 touches within a 50-minute session) focused on game-like situations in a controlled environment. The new location, 18021 Alderwood Mall Parkway in Lynnwood, is slated to open to the public on November 10. Sound FC is the sole premier soccer club chartered by Washington Youth Soccer to represent the South Snohomish County (Edmonds School District) and Northshore Youth Soccer (Northshore School District) associations at the highest level of club play in Washington, the Regional Club League. Headquartered in Costa Mesa, California, TOCA Football Inc., is a football/soccer technology company which aims to re-imagine and elevate the soccer experience by creating innovative learning environments and products to inspire players of all levels to Find Their Best. For more information, please follow us at TOCAfootball.com, @TOCAlynnwood or reach out at media@TOCAfootball.com.